Blaulicht spoke with Reto Grob about the digital future of emergency services work. Home/News/Blaulicht spoke with Reto Grob about the digital future of emergency services work. Simulate training operations digitally and realistically? Wear “patrol” glasses on which information can be imported in real time? This will soon become reality. The rapid development of VR (Virtual Reality) and AR (Augmented Reality) tools for emergency services organizations (in German called Blaulichtorganisationen meaning “blue light organizations”) is in full swing. 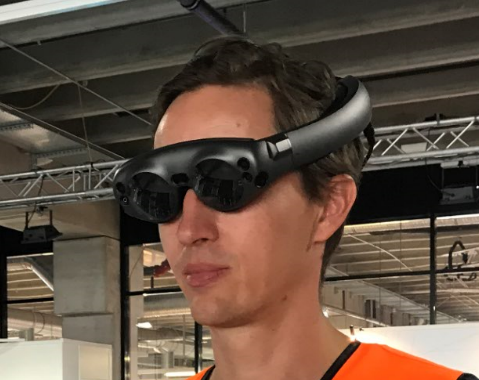 When asking Reto Grob of Augment IT at the Zurich software company Netcetera about VR and AR scenarios for emergency services organizations, he speaks of a currently unpredictable range and depth of application. “Especially in the area of AR, the technology is in a rapid development process. At the moment, demand is being registered primarily in the area of vehicle and task force navigation in order to get to the right place faster and in a more targeted manner. “If we disregard data protection, a great deal is already technically possible,” says Grob. For example, car types can be clearly identified to make rescuing people at accident sites safer. AR allows us to recognize control signs, faces or even entire scenes on the road in order to act correctly with the help of artificial intelligence. Grob describes Switzerland as innovative and creative in this field. Police corps and fire brigades have already implemented Proofs of Concept. However, Grob does not want to name names. He points out that the use of AR “always requires adjustments to the processes” and adds: “If the emergency services organizations now actively take up the changes, I am convinced that the corresponding special technology will also be available in good time”. In general, Grob adds, training and education are one of the obvious areas of application for both VR and AR. “AR can be operated in real environments with deployment scenarios, while VR can mainly be used for basic training”. Particularly in the tactical area, a great deal can be trained with AR, especially since a wide variety of scenarios can be practiced and periodically tested. “All of this without great expenditure on material resources, possibly even led by a trainer who does not have to be on site at all”. He adds that ideas, possibilities and requirements had already been taken up early on with various police corps and fire brigades in innovation workshops. This has already led to pilot projects, which are now being translated into concrete projects and where the technology can be used productively. Grob also emphasizes: “If not all projects are used equally productively, it is important to deal with them now and push ahead with the operational adjustments. As a rule, the technology is ready faster than behavioral changes can be implemented”. He calls for an examination of the possibilities that lie dormant in this technological change today, “even if not everything is fully developed”. It is important to recognize that organizational and process-related adaptations are always needed. The interview was published on blaulicht-iv.ch. Futur Health 2019: What AR enables in healthcare? Augmented Reality – soon to the operating theater?